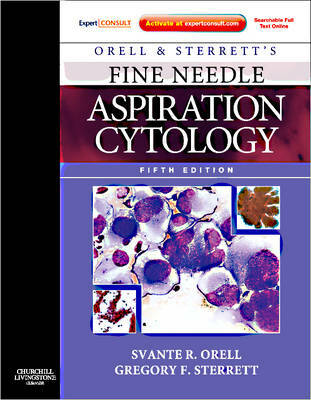 A major revision of the leading textbook of FNA cytology Both text and illustrations provide a systematic and logical approach to the acquisition, interpretation and diagnosis of Fine Needle Aspirate biopsy specimens. Orell's FNA Cytology will assist in establishing diagnostic criteria and results in the examination of benign and malignant condition in all body systems where the technique is currently applied. The information is always presented in a clinical context: it details the role of FNA and other ancillary techniques in the investigative sequence (the cytological findings are always set in the context of the patient's clinical history, physical exam and other laboratory tests). It gives practical, technical advice on how to obtain good smears and alerts the reader as to possible diagnostic pitfalls and complications. The contents are organized in a framework of anatomical regions (rather than histopathological classifications) in order to reflect the way problems present in clinical practice. Each chapter is divided into two parts: the first deals with indications, accuracy, techniques and complications; the second illustrates the cytological patterns and their implication. Both common and rare conditions are covered.Provides practical tips and advice on how to avoid pitfalls and ensure accurate diagnoses. Over 1,200 colour illustrations capture each entity's cellular, morphological and immunohistochemical appearance. Chapters have been up-dated and revised and a brand new one on cytological findings in infectious diseases added. Both MGG and Pap smears illustrated in parallel as well as the corresponding histology to help provide side-by-side analysis. Access the full text online and download images via Expert Consult. Brand new chapter on cytological findings in infectious diseases. Inclusion of immuno-profiles and other relevant ancillary tests. New illustrations. New contributing authors. Available online via Expert Consult.